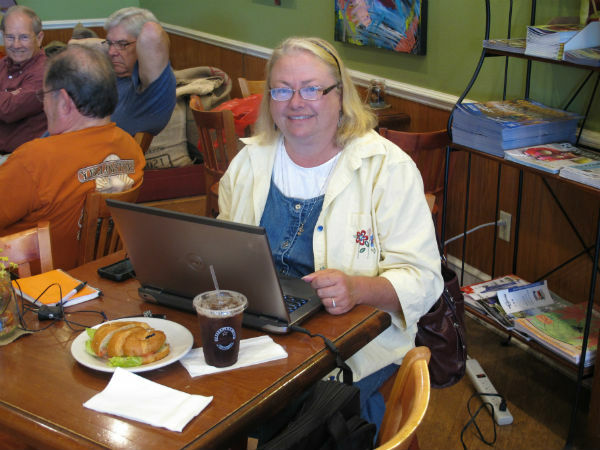 Cathy Benson at her “bureau” for The Botetourt View — in a coffeeshop in Daleville, Virginia. The Arizona Republic caused a stir this week when it told reporters with three community sections that they were getting laptops — and henceforth needed to work out public wi-fi centers instead of a formal newsroom. The Phoenix Business Journal reports that the journalists were told to seek out Starbucks and McDonald’s as work locations. Judging from the journal’s report, and the comments the story generated, the response from journalists has been pretty negative. I hate to tell my fellow journalists they’re wrong but . . . they’re wrong. This is a great thing, and they should have been the ones pushing for this all along. Now, I will confess I don’t know the work climate these days at the Arizona Republic. I know there have been lay-offs, so I suspect the environment probably isn’t the best. How could it be? And perhaps this order from above was not handled well. How many orders from above ever are? However, setting all that aside (which I realize some in Phoenix may have a hard time doing), the essential move here is a shrewd one. More journalists OUGHT to be working out of coffee shops, and not barricaded in downtown fortresses, walled off from the communities we’re trying to serve. That’s especially true of community news sections, which these are. In fact, just two days ago I posted about our experience in Roanoke, Va. with coffeeshop bureaus. 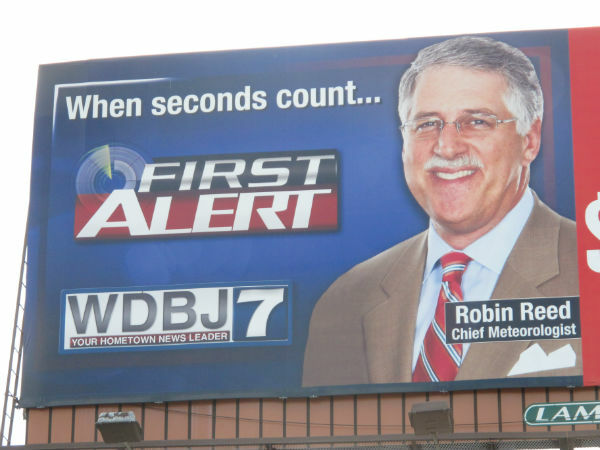 In 2008, we at The Roanoke Times shuttered a money-losing community news tab and in its place created three new community tabs (each aimed at a more specific community than the old Roanoke Valley-wide product). A key part of our business model for those three publications — The Botetourt View in Botetourt County, So Salem in Salem and SWoCo in Southwest Roanoke County — was that the journalists would work out in the community, not in downtown Roanoke. Specifically, they’d be true mobile journalists — armed with a laptop, a cellphone, and access to wi-fi. For the past five years, our community journalists with those publications have worked out of coffee shops (and sometimes other locations, such as libraries.) We even advertise regular office hours for them. Cathy Benson, our community journalist in Botetourt, often has people lined up to see her when she sets up shop on Wednesday mornings at the Mill Mountain Coffee & Tea in Daleville. She and her colleagues might only venture into the downtown office once a week, and then just for a short period of time to do things you can’t do remotely — meet face-to-face with an editor, for instance, or fill out the obligatory paperwork. Our coffee shop bureaus have been a key part of our success in each locality. They put us closer to the community. I can’t tell you how many times our journalists have come across stories simply because they’re out there and visible. I guarantee those story tips wouldn’t have happened if they were sitting in downtown, behind a security guard and three stories of a corporate facade. Yes, this saves the Arizona Republic some money, to be sure — but journalists who want to keep their jobs ought to be celebrating that fact, not complaining. Furthermore, reporters — especially community news reporters — are supposed to be out amongst the public. If they want to sit in an office most of the time, well, they’re in the wrong profession. I almost wrote, with tongue only partly in cheek, that if they wanted to be in an office, they should become editors. Except . . . I’m an editor and I had my own experience with working out in public. About two years ago, my wife had surgery and I had to spend part of the day at home with her while she recuperated. Rather than burn up time driving to downtown, I decided to work a half-day each day out of the public library near my home. I found it an invigorating experience. True, there were certain key computer functions I couldn’t do remotely than I really needed to be in the office for. Still, just being out in public like that for several hours a day gave me a fresher perspective on the community I’m paid to serve. I don’t know why more papers don’t embrace this coffeeshop bureau model. Yes, I completely understand you don’t want to be making sensitive investigative journalism phone calls from a public space. But for community journalism — and some shades of even “regular” journalism — this is how the world ought to be working. And I’m happy to see that the Arizona Republic has now followed The Roanoke Times on this cutting edge, even if it came to this decision for the wrong reasons. Our community news publications make April and Jim Pruitt’s dream come true — a John Deere wedding. Investigative reporters like to talk about the impact their stories have had — corruption exposed, laws changed, the sort of things that win Pulitzer Prizes. Community journalists like to talk about the impact their work has had, too. It’s just on a different scale. Here’s one neat example from today: Thanks to two of our community news publications in Salem, Va., and Botetourt County, Va., we made a couple’s dream come true. We helped find them tractors for their wedding. More accurately, we connected them with readers who supplied those tractors. Allow me to explain. In early September, April Harris contacted the newspaper with an odd, and urgent, request. 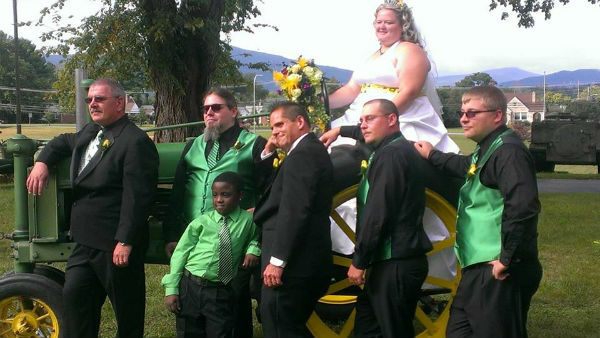 She and her fiance, Jim Pruitt, has their heart set on a John Deere-themed wedding. He’s a big tractor fan, she embraced the concept but they were having a hard time finding someone to loan them some farm machinery as a backdrop for their wedding photos. The couple was getting married in, and planned to live in, Salem — so we put an item on our Salem community news site (and then later published it in print.) We also did something we didn’t normally do, and that was to also publish it on our Botetourt County community news site (and followed it up in print there, as well.) There was no Botetourt connection, and normally we’re very strict about such things with our community news site. However, Botetourt is still pretty rural, and I suspected there might be some people there with big tractors, and big hearts, willing to help the couple. Turns out that multiple readers in both localities saw the item (it’s unclear whether they were responding to the print version or the online version) and responded. Come wedding day, the couple had not one, not two, not even three — but four John Deere tractors. Plus a riding lawn mower! April shared her wedding photos, which we have posted here on our Salem site and here on our Botetourt site. It’s no Watergate, but we just had made one couple’s dream come true, all thanks to our hyperlocal sites. Were we the first to put journalists in coffeeshops? 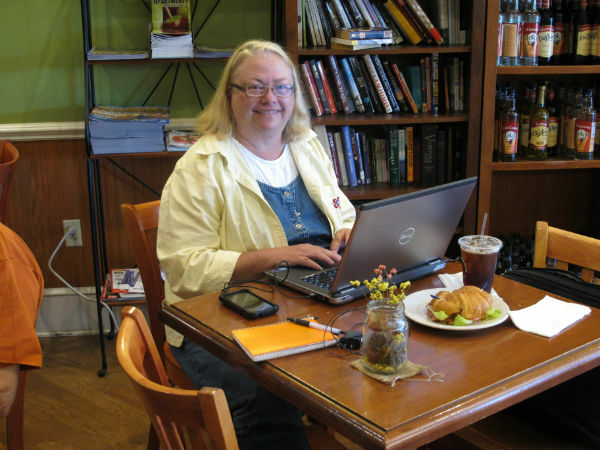 Cathy Benson of The Botetourt View sets up shop at the Mill Mountain Coffee & Tea in Daleville, Virginia. Over the years, I’ve seen chatter in the industry from time to time about the idea of stationing journalists in coffee shops. David Cohn, aka “digidave,” wrote about this concept in this 2009 blog post which envisions a newspaper that operates a coffee shop. The idea is to take journalists out from behind their downtown fortress and put them out among the people. The Huffingon Post also reported in 2009 about a small Czech newspaper that was operating out of a coffee shop. The Asbury Park Press got some buzz from American Journalism Review in 2010 when its Freehold hyperlocal site stationed its community reporter in a coffee shop. I’m surprised, though, that no one has written about The Roanoke Times — whose journalists-in-coffee shops business model predates all those above. In 2008, we closed a money-losing community news tab and in its place created three new community news publications — each with a strong web presence. Each was in outlying growth area — The Botetourt View in Botetourt County, So Salem in Salem, SWoCo in Southwest Roanoke County. 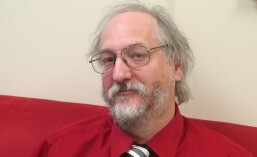 And a key part of the business model was that the the community journalists for each of them would not be working out of the main newspaper building in downtown Roanoke, but would be out in the community. How “out in the community”? Well, from day one, we have advertised that the community journalists hold office hours — in a coffee shop. Each Wednesday morning, the community journalist in each publication sets up shop in the Mill Mountain Coffee & Tea location in their respective zones. Sometimes people come to see them to offer stories, sometimes they don’t. But when they don’t, well, that’s where the journalists work. We don’t need a bricks-and-mortar building, just a laptop and wi-fi. We’ve found the idea to be very successful, especially in Botetourt County. On some Wednesdays, community journalist Cathy Benson of The Botetourt View has a line of people waiting to see her at her coffeeshop bureau. In fact, she’s found the concept so useful that she now holds regular office hours at other public locations on other days around the county, making her a true mobile journalist. I remain surprised other papers haven’t embraced this concept, because it does two things at once — it puts journalists in closer contact with their community and . . . it saves money. Who needs bricks-and-mortar anymore? 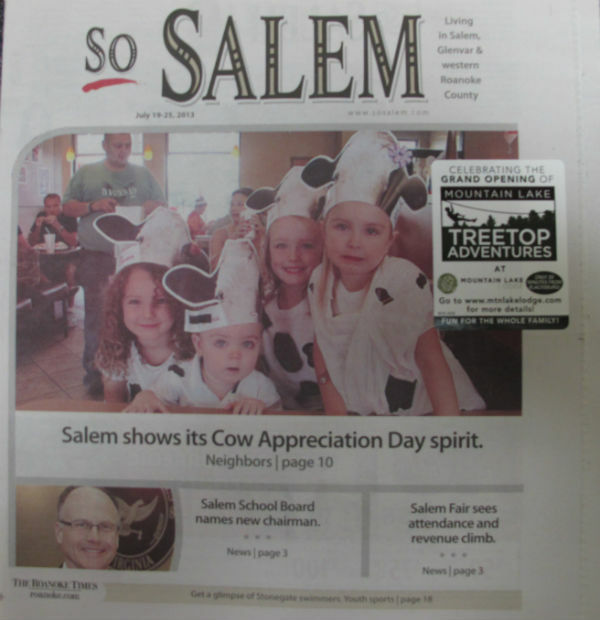 The cover of our Sept. 27 edition of So Salem, our hyperlocal publication for Salem, Virginia. 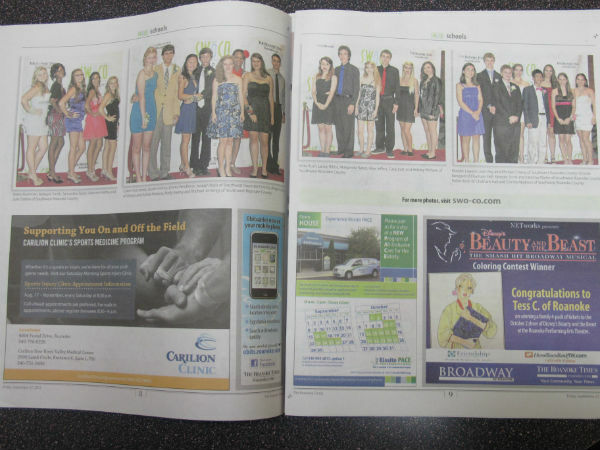 One of the signature things we do with our community publications in Roanoke is cover high school homecomings and proms. Our target audience isn’t the kids; it’s their moms. Our community publications focus very tightly on women with kids in the home — i.e., soccer moms. That means lots of schools coverage, lots of coverage of youth sports, from high schools down to rec leagues, and yes, it means we send photographers to high school homecomings and proms. We have a “paparazzi” photo crew — a freelance operation — that shows up with an actual red carpet, and a backdrop with our logo. Over the years, these have become so popular that now, the schools often call us to schedule us before we get around to contacting them. Better yet, these are some of our biggest traffic-drivers of the year online. Here’s some examples of that coverage. Here’s the Sept. 27 cover of SWoCo, our hyperlocal publication for Southwest Roanoke County, Virginia. Here’s what the inside looks like. 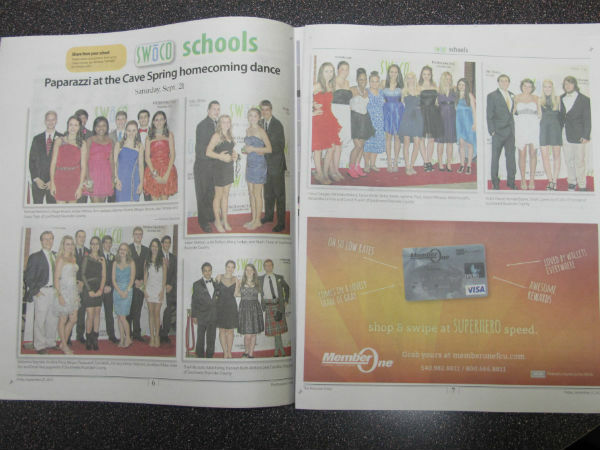 Prom coverage looks just the same, only with fancier dresses. Yes, we always do at least four pages worth of coverage. More if we can. With still more online. 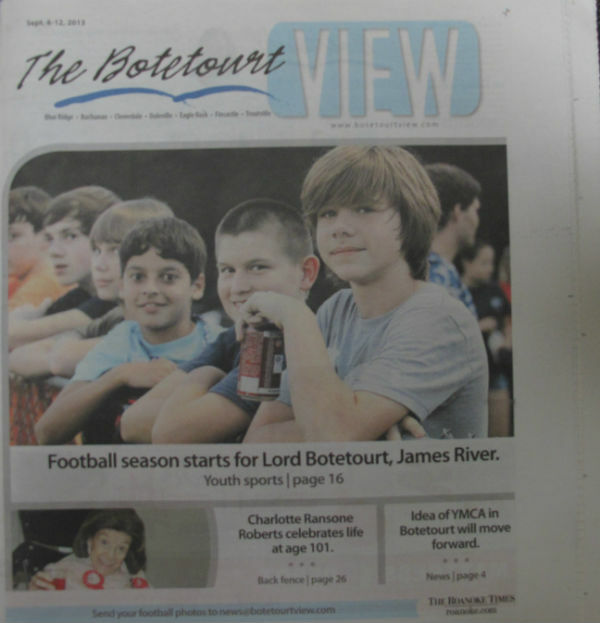 The cover of The Botetourt View, our community news publication for Botetourt County, Virginia. We almost always feature kids on the cover. I am convinced that here in Roanoke we have evolved a new community journalism. Our community news products may superficially look like colorful version of a traditional community news tab — but they are really web-first products that rely on a robust social media presence. Recently a colleague went to a conference where digital products was on the agenda. I looked at the description and told him I should be the one presenting. In jest, I gave him this promotion, although as I look at it, it’s dead-on. I’m really surprised other media companies haven’t tried to copy what we’re doing. • Do you face competition from suburban weeklies? We can show how to compete against them and beat them at their own game. • Is your existing community news product underperforming? We can show you how we took a money-losing product and turned it into not one but three different money-makers. • Do your advertisers want to reach women with children in the home? We can show you how we’ve created an audience that isn’t otherwise engaged with a daily newspaper. • Do you want more coverage of high school sports but can’t afford it? We can show you how we’ve created a guerrilla army of people who now send us hundreds of photos each week for dirt cheap, or sometimes even free. • Do you want to know how you can use online to make people want your print edition even more, instead of less? We can show you how we now generate more than 1 million pageviews per year, and at the same time increased the demand for print. 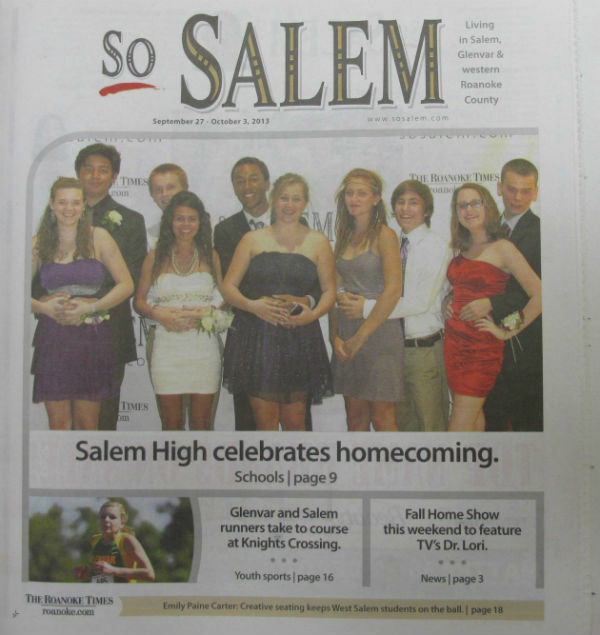 So Salem, our community news publication for Salem, Virginia. Notice the sticky note — advertisers love these. The cover of SWoCo, our community news publication for Southwest Roanoke County, Virginia. Yes, we cover rec sports!